However, it became apparent that the course wasn't right for her, so she decided to leave it at the end of the first year and re-evaluate her options. The next year, she began at LSBU studying BA (Hons) Business Studies, which provided fantastic experiences such as studying in Paris for a semester. As part of Lucy's degree, she had a year-long internship at NBC Universal (NBCU), an international TV and film company based in central London. She worked as the Marketing & PR Assistant to the global TV division working on channels such as E! Entertainment, The Style Network and Syfy. "It was a demanding role, but great fun and I learnt a lot. 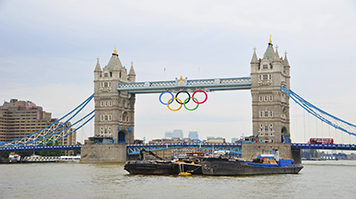 This dual role required me to work on international marketing campaigns, high profile press tours with the stars of key shows and organise and assist at key corporate events including the London 2012 Olympic Games. The Director for PR became my mentor and friend as we worked together; she took a genuine interest in my education and allowed me to learn about other parts of the business." A typical day for Lucy consisted of working on one of many projects, such as organising the logistics for a high-profile conference for senior networks executives flying over from the US. Later she would join the international PR conference call to discuss which journalists were attending a press tour that was coming up and she would follow up the meeting by sending the minutes to all PR at the international offices. Finally she would work with the Production and Creative teams on a new marketing campaign, for example for cop-show Rookie Blue, ensuring that they had all the materials needed for their photo shoot on set in Canada. It was a fast-paced and challenging role, but Lucy's time on placement was a resounding success. Not only was she awarded NBCU's highest award, the GEM (Going the Extra Mile) for the work she did on her internship, she was also awarded the LSBU Mick Jarvis Industry Award for the best placement project. Having made such a positive impression at NCBU, she has since joined BBC Worldwide as Global Marketing Co-ordinator now she has graduated. Lucy is quick to pay tribute to the careers team at LSBU for helping her secure a position at NCBU. "They were absolutely fantastic. Not only did I learn how to write a proper CV and an attention-grabbing cover letter, but I was able to prepare for interviews, practice my self-selling 'pitch' and find out about opportunities at the Job Shop. The careers department really changed my approach to job hunting and gave me the opportunity to apply for the NBC role from which I am still reaping the rewards." Read more about careers and employability.